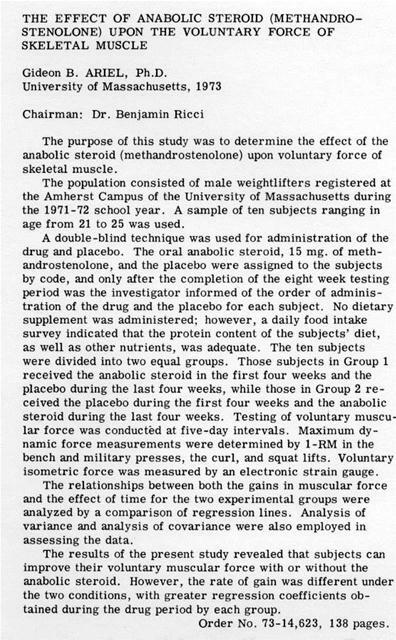 The purpose of this study was to determine the effect of the anabolic steroid (methandrostenolone) upon voluntary force of skeletal muscle. 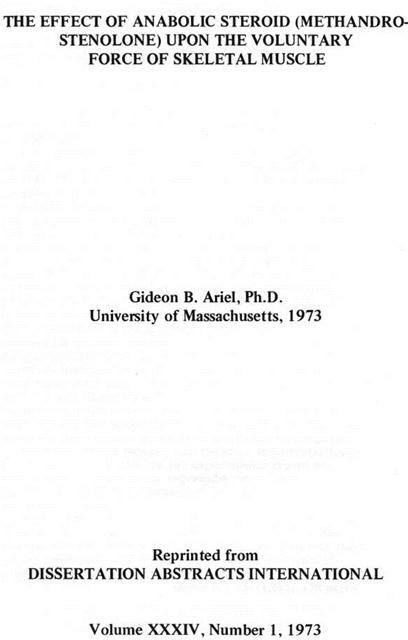 The population consisted of male weightlifters registered at the Amherst Campus of the University of Massachusetts during the 1971-72 school year. A sample of ten subjects ranging in age from 21 to 25 was used. A double-blind technique was used for administration of the drug and placebo. The oral anabolic steroid, 15 mg. of methandrostenolone, and the placebo were assigned to the subjects by code, and only after the completion of the eight week testing period was the investigator informed of the order of administration of the drug and the placebo for each subject. No dietary supplement was administered; however, a daily food intake survey indicated that the protein content of the subjects' diet, as well as other nutrients, was adequate. The ten subjects were divided into two equal groups. Those subjects in Group 1 received the anabolic steroid in the first four weeks and the placebo during the last four weeks, while those in Group 2 received the placebo during the first four weeks and the anabolic steroid during the last four weeks. Testing of voluntary muscular force was conducted at five-day intervals. Maximum dynamic force measurements were determined by l-RM in the bench and military presses, the curl, and squat lifts. Voluntary isometric force was measured by an electronic strain gauge. The relationships between both the gains in muscular force and the effect of time for the two experimental groups were analyzed by a comparison of regression lines. Analysis of variance and analysis of covariance were also employed in assessing the data. The results of the present study revealed that subjects can improve their voluntary muscular force with or without the anabolic steroid. However, the rate of gain was different under the two conditions, with greater regression coefficients obtained during the drug period by each group. Order No. 73-14,623, 138 pages. Generated on 4/25/2019 9:03:39 PM (PST) ADI/HQ/GBA/2019/ARIELCLOUD/v3.0.2018.0126.